Newtown Woods in Newtown, CT is a community for active adults aged 55 and over. This development in prestigious Fairfield County, features new and resale condominiums and townhomes in a variety of designs. Active adults have access to great resort-style amenities and beautiful views of the Newtown area. This 55+ community is located nearby plenty of attractions. Residents can explore the abundant dining, entertainment and cultural offerings that are only a short drive away. The vibrant towns of Danbury, Norwalk and Stamford, Connecticut, can be reached in 20 minutes or less, while New York City is 60 minutes away. Residents can spend their days being social and active at the 5,800 square-foot clubhouse that offers a number of amenities for a fun lifestyle. Active adults can stay healthy and fit by working out in the fitness center or yoga studio, and relax in the sauna afterwards. They can mingle with neighbors in the gathering room or have a drink at the bar. Homeowners who are feeling creative can spend some time in the classroom and art studio, or head to the billiards and game room for fun activities like playing cards, pool, or board games. Residents also have access to a catering kitchen where they can make a snack or host a pot luck lunch. Outdoor amenities include a heated pool, spacious patio, bocce ball court, and scenic walking and biking trails that meander throughout the peaceful neighborhood. Homeowners are sure to get plenty of fresh air in this picturesque 55+ community. Construction started in 2011 and upon completion this active adult community will have 178 residences featuring ranch-style condominiums and two-story townhomes. All homes feature lavish first-floor master suites and generous entertaining spaces. The Regency Collection offers five floor plans with two bedrooms, two bathrooms, and one-car garages. These single-level condo-style residences range from 1,484 to 1,911 square feet and feature low-maintenance living at its finest. Residents enjoy sunny balconies or patios, gourmet kitchens with abundant cabinet space and airy open floor plans. The Townhome Collection includes eight home design options ranging from 1,537 to 2,123 square feet. They have two bedrooms, two or two-and-a-half bathrooms, and attached two-car garages. These luxurious townhome residences feature first-floor master bedroom suites, step-less entries and private garage access. Elegant architectural features include great rooms with vaulted ceilings, Roman tubs with separate showers and generous walk-in closets. With an outstanding location, excellent value, and a wealth of amenities, this active adult neighborhood is set to be the premier 55+ community in the Newtown area. Homeowners can take an aerobics class, relax by the fireplace with the latest novel or join friends for an afternoon of bridge. Residents can also take advantage of an abundance of opportunities for lifelong learning. Newtown Continuing Education offers a variety of classes on subjects such as nutrition, art, gardening, computers and yoga. Western Connecticut State University, just 12 minutes away, offers continuing adult education courses and degree programs, while Fairfield University and Yale University are both within an hour's drive. This age-restricted neighborhood is just minutes from I-84 and a short drive from the Connecticut shoreline. Golfers can tee off on one of the many public golf courses located nearby. These include the extraordinary Richter Park Memorial Golf Course, which was rated by Golf Digest as one of the nation's top 25 public courses and is only a few minutes away in Danbury. The town of Newtown, Connecticut is located in Fairfield County and is also home to Stamford, Darien, Norwalk, Westport, Fairfield, and Bridgeport. About 45 minutes east of Newtown Woods is New Haven, home to Yale University. Bradley International Airport in Windsor Locks, CT is about an hour away. 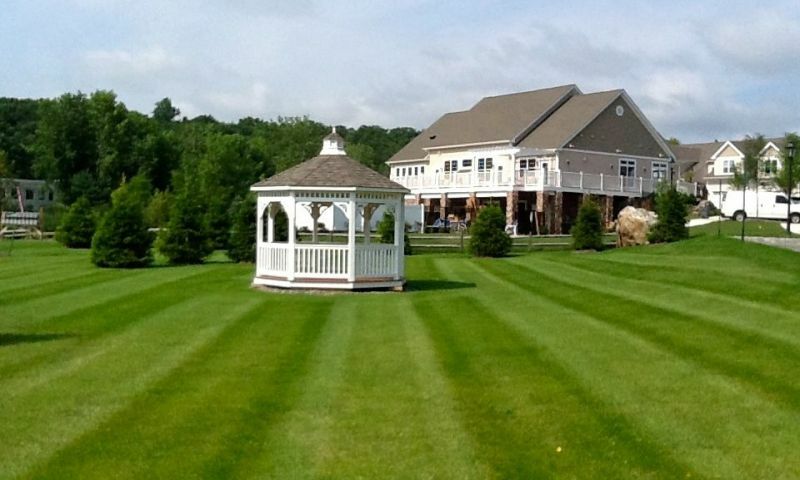 This age-restricted community offers active adults great amenities, elegant homes, and a beautiful setting in Western Connecticut. Clubhouse - 5,800 Sq. Ft. There are plenty of activities available in Newtown Woods. Here is a sample of some of the clubs, activities and classes offered here. The Regency Collection is single-level condo-style homes with elevator service and private garages. These floor plans offer 1,484 to 1,911 square feet of living space and have two bedrooms, two bathrooms, and one-car garages. The Townhome Collection offers 1,537 to 2,123 square feet of living space. These townhomes feature first-floor master suites, step-less entry, private garages and come in ranch-style and two-story home designs. They have two bedrooms, two or two-and-a-half bathrooms, and two-car garages. My husband and I have been out to look at the homes here probably four times now over the past year. The community is really coming along and the models are gorgeous. I'd love to buy a place here tomorrow but we have to sell our home first and we're going to wait until next year when hopefully the resale values come up a little more. If not we'll probably just make the move anyway, it's time to move on! I am looking forward to condo living and not having any outside yard work or snow shoveling to take care of. I guess I'll have one more winter of shoveling, or at least my husband will! 55places.com is not affiliated with the developer(s) or homeowners association of Newtown Woods. The information you submit is distributed to a 55places.com Partner Agent, who is a licensed real estate agent. The information regarding Newtown Woods has not been verified or approved by the developer or homeowners association. Please verify all information prior to purchasing. 55places.com is not responsible for any errors regarding the information displayed on this website.